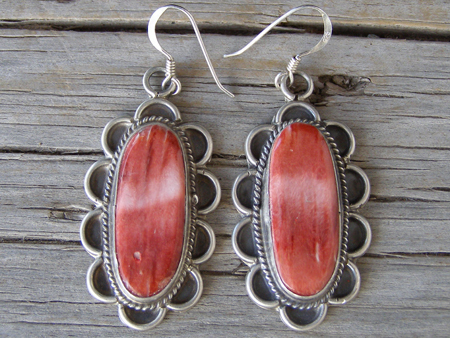 These pretty earrings by Leon Martinez are set with matched ovals of red spiny oyster set in smooth bezels wrapped by twist wire. The drops are free-swinging from French hooks made of Sterling. Hallmarked LS and stamped Sterling on the back of the drops. Spiny Oyster: 1" x 7/16"
Size of drops: 1 3/8" x 3/4"